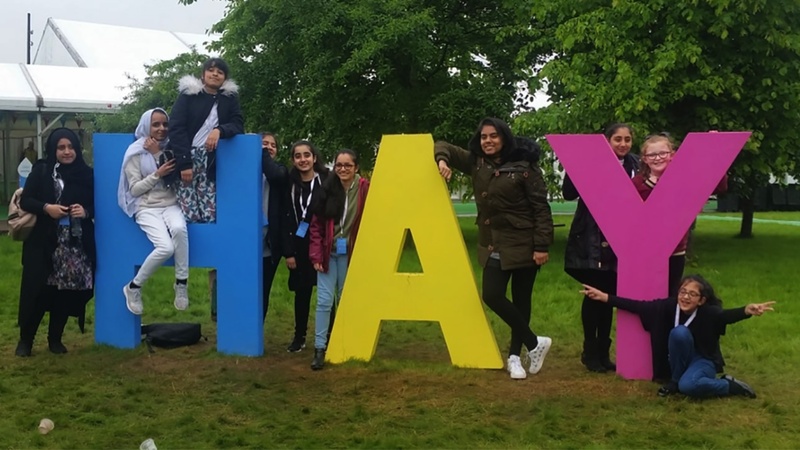 Hay Festival, in collaboration with Bradford Literary Festival, are creating a cultural exchange for secondary school pupils from rural Herefordshire/Powys and urban Bradford in 2019, building on the success of the 2018 cultural exchange between the festivals. This experience offers both groups of pupils access to culture in new environments, helping them to understand, empathise and engage with the lives of others. 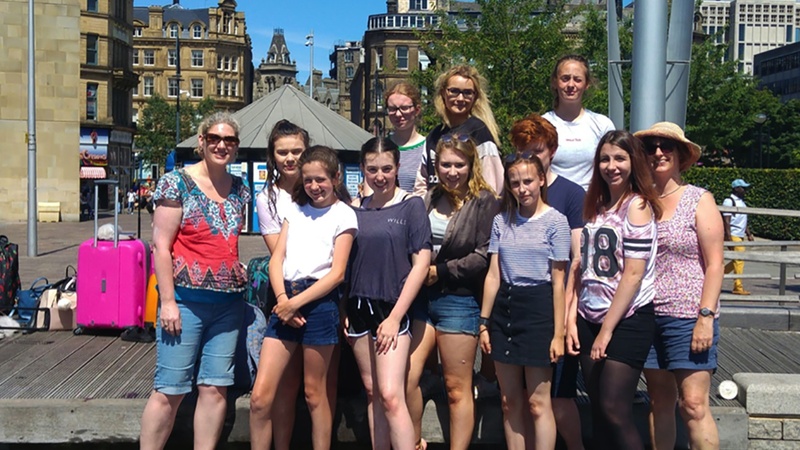 On Thursday 28 June 2018, ten Year 9 female students from Fairfield High School and two English teachers arrived in Bradford for three days of cultural and social exchange. None of us knew really what to expect, but it would turn out to be a life-enhancing visit. When Aine Venables, Education Manager at Hay Festival, contacted us about the project in early 2018, we were thrilled and knew instantly it was something we wanted to be involved in. 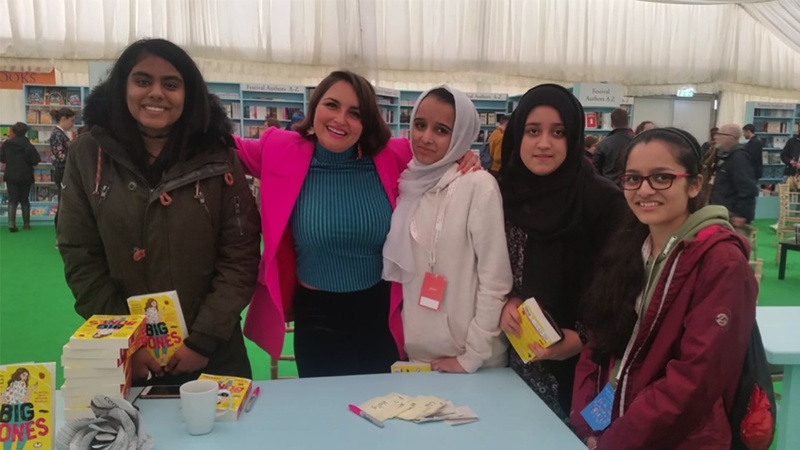 Hay Festival has always been very good to Fairfield, and meeting students from such a multicultural, hugely populated and historic city as Bradford – especially with the trip’s strong connections to the university and the Literature Festival – promised to be very special. Our ten girls were chosen by the English faculty, as students who had shown an ‘above and beyond’ interest in the library and reading, or who were struggling with low self-esteem, or from backgrounds where low aspirations and even lower social mobility were the norm; sometimes this crossed over into all four areas. We corresponded with the girls from Beckfoot Upper Heaton and met them in person at Hay Festival's Secondary Schools’ Day on 25 May. Despite Beckfoot being a Muslim school and that, for example, many of their girls covered their hair, they loved Facebook, Justin Bieber and now, Shepherds’ ice cream and were not so very different from the average teenage girl. One month later, we were met by Rachel Shaw, Educational Director for Bradford Literature festival, who took us up to our lodgings, a university house in the heart of the Bradford Uni campus, and later we all got to know each other over dinner at My Lahore, a renowned curry house in the city. Most of the girls were apprehensive about the spiciness of the curry, but they all had an authentic dish and sampled each other’s. Our evening's entertainment was a screening of 3D Jurassic Worldin the IMAX cinema at the Science Museum with its surround and ‘up and over screen’ sound. The girls were hugely impressed by this – most having never been in such a cinema – and we screamed a lot as DNA-modified dinosaurs slipped their leashes and hurtled towards us. On our way home we walked past a mosque, beautifully lit up with rainfalls of white and blue lights, and they were surprised to see the building was a house in an ordinary street that had been converted for worship. On Saturday morning, in the Richmond Building on campus, we joined workshops on An Inspector Calls andRomeo and Julietin a huge lecture theatre. The hall filled up with hundreds of schoolchildren, mostly Muslim, with the habitual cheeky chewing gum, two-hour hair-dos and shirts hanging out. To our girls’ credit – and perhaps they had more multicultural awareness than I had expected – they were not remotely fazed or even seemed to notice the ethnicity of most of the audience; they were, however, in awe of how ‘cool’ or ‘street’ they seemed. We had key seats at the front and Beckfoot had 30 or so students sitting just across the gangway from us. The workshops were run by three actors who had formed a Theatre in Education group called Drama Impact. They were fabulous. 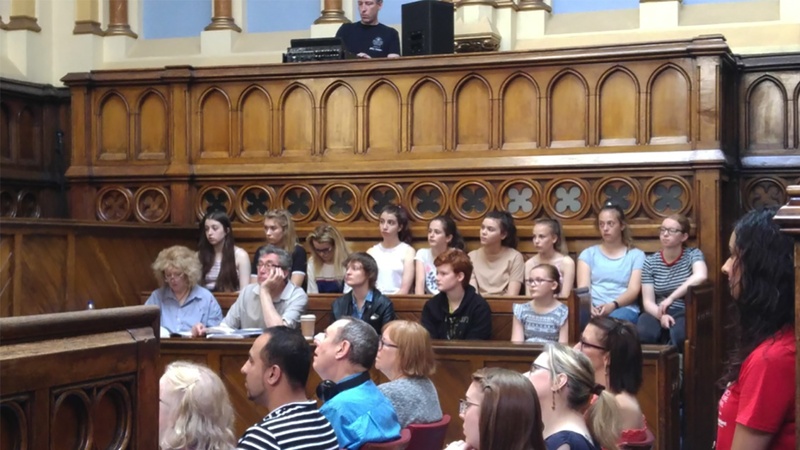 They kicked off with An Inspector Calls(the playwright J B Priestly was a Bradford boy) and immediately called for actors from the audience to help with the opening scene. Two of our contingent volunteered. At the end of the first session, one of our girls, who is either withdrawn or combative in lessons, turned round to me and said, "That was really interesting, Miss". It felt like the start of a new way of looking at things for her, further developed by her volunteering for roles in the afternoon’s session. The afternoon workshop of Romeo and Juliet was equally captivating. By the end of the day, eight of our girls had joined the actors on stage; some were already confident enough not to care what anyone thought, but the others, when at school, are crippled by what their peers will think about them. Here, where nobody knew their name, they found that they could be free to do what they wanted to do – and they wanted to be on stage. In front of 400 students! We had discussed with all the girls before they went that we were leaving behind our Hereford selves and any woes and baggage that went with them – and were going to be our fantasy, Bradford selves for the weekend. These workshops were the moment when I knew that they had done just that. On Sunday morning, we met up with Rachel again to go to City Hall for our first talk of the day, a ‘Write what you don’t know’ event by three successful crime writers who had gone against convention to create protagonists from completely different backgrounds and cultures to their own; our crew especially liked the latest publication from Vicky Newham about the gory murder of a female headmistress! Back to the Richmond Building and into the ‘Small’ Hall (still pretty big by Fairfield standards) for a talk on ‘The Monsters of Mary Shelley’, which was an absolute treat. A university professor, a scientist and a journalist, all female, talking sensibly but animatedly about Mary Shelley’s childhood and early adulthood; they were all generous to each other (no egos here) and, as one of my girls put it, "Didn’t you think, Miss, it was just like people chatting in your living room?". Rachel was utterly amazing, running about with us while juggling a million other things, and still finding time to chat to the girls. Some of the more troubled girls in particular warmed to her kind yet no-nonsense approach. The itinerary she devised for us was perfect – a wonderful mix of educational, cultural and social opportunities. Our ten girls come from a very small high school in rural Herefordshire, so close to Wales that there might well be dragons, from an area so beautiful that is called the Golden Valley. However, it is an area of intense rural deprivation, with academic and social aspirations among the local population very low. To be able to take a small group away from their peers, away from social pressures and from parental expectations to a wholly different environment and let them see the world as offering something beyond their front door, is to potentially change their life. The experiences they have had, the people they have met and the confidence they have gained from this exchange will stay with them, sustain them in darker times and give them wider perspectives, ideas and hopes that I am sure they would not otherwise have had. It was truly wonderful and in their own words, "Easily the best trip from school, ever, Miss!"